Nineteen eighty-two was not a happy year for freedom. A severe and protracted recession gripped America. Many were beginning to wonder if Ronald Reagan was going to be a one-termer. Unemployment in Britain hit a postwar high. Across the Channel, François Mitterrand was busy nationalizing banks and raising taxes. Daniel Ortega’s Sandinistas were firmly in control in Nicaragua. The Soviet grip on Eastern Europe seemed tighter than ever. Solidarity appeared finished in the wake of General Jaruzelski’s declaration of a “state of war” against his own country. In the Middle East, Lebanon was descending into anarchy. And just to the north-east, Syria’s president Hafez al-Assad — father of Bashar al-Assad — was ordering his security-forces to level the town of Hama. Thousands subsequently died. Some things never change. Of course there was the occasional bright spot amidst the gloom. Against all odds, Britain liberated the Falklands, thereby precipitating the collapse of Argentina’s corrupt military junta. 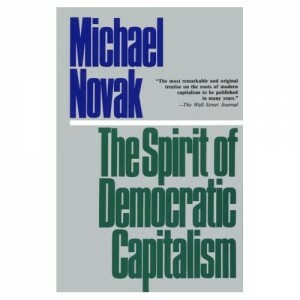 Thirty years ago, however, another event occurred that would make a profound long-term contribution to the struggle for freedom: the 1982 publication of Michael Novak’s magnum opus, The Spirit of Democratic Capitalism. From a 2012 vantage point, it’s easy to forget just how radical this book was. In penning the Spirit, Novak was the first theologian to really make an in-depth moral, cultural, and political case for the market economy in a systematic way. Needless to say, Novak’s book generated fierce reactions from the religious left. The opprobrium was probably heightened by the fact that the Spirit confirmed what had become evident from the mid-’70s onwards: that Novak was well on his way to abandoning his previously left-wing positions. Thirty years ago, however, many Christians — Protestant, Catholic, Orthodox, clerical, and lay — were marching in precisely the opposite direction to Novak. Theologians in the Americas and Western Europe were still waxing lyrical about “dialogue” with Marxism. The fight-back led by Blessed John Paul II and Cardinal Joseph Ratzinger against the doctrinal heresies and Marxist analysis underlying liberation theology had only just begun. At home, America’s Catholic bishops conference was issuing what seemed to be an endless stream of commentaries about economic subjects that invariably reflected a monotonously soft-left line. Then in 1986, the bishops conference published Economic Justice for All — a document whose 25th anniversary passed almost unnoticed in 2011, and which bore all the hallmarks of the influence of people who thought the “two Johns” (Rawls and Maynard Keynes) had said all that ever needed to be said about justice and the economy respectively. Unlike Economic Justice, Novak’s Spirit continues to provide inspiration today — something that hasn’t been limited to Americans. Its samizdat translation and publication by dissidents in Communist Poland in 1986 reflected the fact that those who actually experienced real socialism in all its deadening grayness not only knew that collectivism had failed; they also understood there was no “third way.” At the same time, Central-East Europeans weren’t impressed with merely utilitarian or efficiency arguments for markets. They wanted to root free economies in a wider and richer vision of the human person. Many of them found what they were looking for in the The Spirit of Democratic Capitalism. Naturally some of Novak’s book has been superseded by events, such as Communism’s defeat in Eastern Europe and the former USSR, liberation theology’s virtual collapse throughout the Catholic world, and the rise of new generations of bishops and priests who know that economic policy is largely a matter of prudential judgment for the laity. And yet the Spirit‘s strengths endure. These include a Catholic mind that takes seriously Adam Smith’s economic and philosophical insights; the affirmation that markets must be grounded upon particular moral, political, and legal habits and institutions; the attention to how awareness of the reality of sin should incubate us against economic utopianism; and, perhaps above all, the sustained effort to locate democratic capitalism within a vision of God and man, thereby giving it genuine theological meaning. All of these intellectual forays helped facilitate a serious reconsideration of the moral merits of market economies by not only Catholics but also other Christians. Many hitherto-prevailing visions of capitalism, such as the thoroughly inadequate and misleading conceptions promoted by Weber and Marx, suddenly seemed very open to question. Across the world, books and articles began appearing that engaged the ideas which Novak had articulated. In retrospect, it’s difficult to dispute the trajectory between particular themes contained within the Spirit and some of the positive statements about the market economy found in John Paul II’s 1991 encyclical Centesimus Annus. In fact the left were the first to point this out! But perhaps the The Spirit of Democratic Capitalism‘s most significant and underestimated effect was upon thousands of business leaders and entrepreneurs throughout the world. Novak had managed to put into words something they instinctivelyknew: that their daily labor was neither a mere necessary evil nor something intrinsically immoral. Instead business could be understood as a vocans ab Deus — a calling from God that allowed people engaged in literally transforming the world to simultaneously transform themselves in the direction of the good. In short, it wasn’t just that, given the right settings, business and free markets are the fastest ways to diminish poverty. It was also possible to find a spark of the Divine in the very activity of business itself. Not surprisingly, Novak’s Spirit still attracts critics today. Some on the left castigate it as an insidious effort to sanctify an essentially immoral system. It also draws heat from those inclined to romanticize a lost world of guilds or who persist in promoting corporatist economic models in the mistaken belief that these are the only economic visions which may be advocated by faithful Christians. And this isn’t simply a matter of clever tactics in what will surely be a ceaseless battle with those who put their faith in top-down planning, social democracy, the welfare state, or “hope-and-change” emotivism and wishful thinking. Morality is as much part of the truth about reality as supply and demand. The most insightful economists, ranging from Adam Smith to Wilhelm Röpke, have always understood this. And herein may lay The Spirit of Democratic Capitalism‘s long-term significance. It continues to ask anyone who cares about liberty to look up and see that the truth about man — economic, cultural, political, moral, and theological — is by its very nature indivisible. We consequently neglect any part of that truth at our peril.